Zinzi December finds lost things, rings, valuable objects, even people, sometimes. She doesn't really like finding people, people who are lost tend to want to stay that way in her experience. Especially if they are missing pop starlet Songweza. Trouble is, when you start digging up secrets it isn't long before the real truth comes to light. Zoo City is populated by the animalled, also known as 'zoos' or, 'aposymbiotes': people who have by way of a henious crime, earned a shavi - a magical animal that accompanies them everywhere as an embodient of their guilt. Zinzi's guilt is a sloth and pretty well sums up this ex-journalist, drug addict and scam artist - definitely on the way down, even if her sloth would prefer up. This is pure film noir at its best. Stupidly I was put off reading by comparison to Jeff Noon and Vurt, but finally someone put me right and Zoo City is a fantastic wild ride through a fantasy Jo'Burg, like Philip Pullman on acid. Zinzi is a smart mouthed screwball who finds herself mixed up with murder every place she goes. Contact her for her lost and found services and you will end up dead fifty pages later. Zinzi is hired for her talent by record producer/recluse Odi who has a couple of twins riding high in the charts under his charge. One of the twins, Song (the talented one) has gone missing and he needs her back before the new album drops. Armed only with a '78 Ford Capri and a motormouth, Zinzi starts her search, delayed only by her love trials with Benoit, who sports a flea bitten mongoose for his sins and the sleazy Vuyo who scams the innocent of their life savings every chance he can and has bought her debts. The atmosphere is all Hillbrow on New Year's Eve (Yes I well recall old fridges and shoes being thrown from high rises at midnight). It doesn't seem unusual at all for sinners to have animals in tow. Precious Ramotswe this isn't. Nothing's quaint and everyones on the make. Trust is scarce. The police well behind the curve. 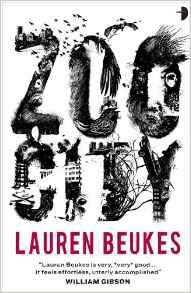 Pacy, crazy, messy, morally bankrupt and insanely exciting, Jo'Burg is the new LA of noir and Lauren Beukes (whose first book was Moxyland) writes with an extreme confidence and style. Zinzi December - Word Pimp - Get your dose now, but don't forget to wear a condom.